A Real Madrid star has lifted the lid on the club's WhatsApp group, and claimed that Los Blancos are more "cautious" with their use of the messaging platform compared to arch-rivals FC Barcelona. 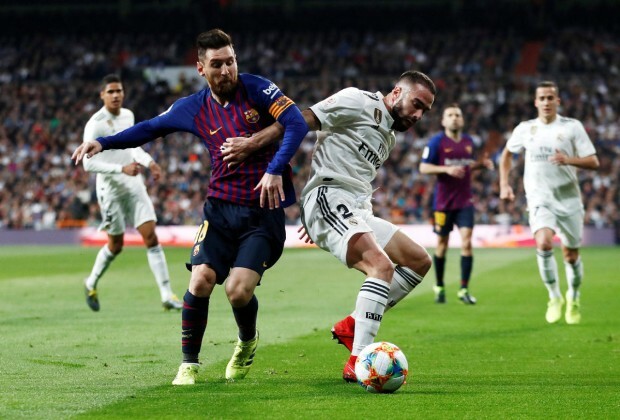 Dani Carvajal recently sat down for an interview with Spanish publication Marca, and alluded to the ins and outs of the Spanish giants' WhatsApp group, said to be titled "First Team 2018-2019". The conversation took place after FC Barcelona defender Gerard Pique revealed in 2018 that the Blaugrana also have a WhatsApp group, which is used to troll their rivals, among other things. Carvajal has now claimed that Zinedine Zidane's men do not utilise their WhatsApp group the way their arch-rivals do. "No, at Madrid we're more cautious," he told Marca. "The administrator is Sergio (Ramos) and we're a group of friends. Some videos are sent but we try to just have a sense of humour. "It's called 'First Team 2018-2019'." The defender, a four-time UEFA Champions League winner, has made 30 appearances across all competitions for Real so far this season. Are you surprised to hear that Los Blancos players have their own WhatsApp group? Have your say in the comments section below.